The cause of poor loading performance from the +2 range of Spectrums is often due to stretching and wear of the tape mechanism drive belt. The old belts perished over time, particularly when stood unused for many years when they would often develop a "kink" where the belt rested unmoved over the capstan. This kink becomes a permanent feature in the belt causing it to jump when the drive is used again. This square section belt is of identical design and size to the original but made from modern, more resilient material. 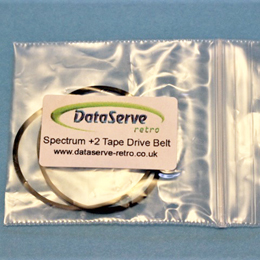 It is a replacement belt for the larger belt on the Spectrum +2 (grey model) and for the single belt on the Spectrum +2A and +2B (black models).